Sorry, currently out of stock - please email info@musicboxworld.co.uk to check availability. An exquisite musical carousel finely crafted with an all mechanical action wound by turning the top of the carousel. As the music plays the top rotates and the carousel horses gently go up and down. Each of the four horses have individual carvings adorned with decoration. 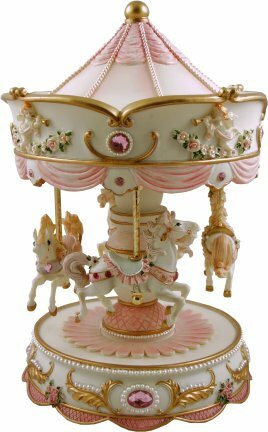 A magnificent carousel that is sure to be centre of any fine collection. Clockwork wound by turning the top of the carousel. All six horse gently go up & down as the carousel turns.